The look of a motherboard may not be all that important, since they're usually hidden well inside cases and beneath all the other hardware used in a computer, but that's never stopped motherboard makers from beautifying their creations before, and ASUS isn't about to start cutting corners now. 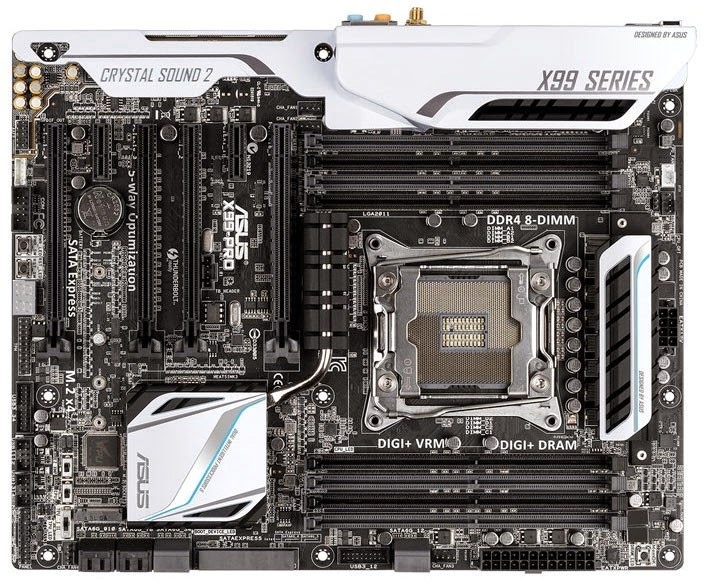 The company has just released the X99-Pro motherboard, which can be considered the second best X99 chipset-based mainboard in the brand's lineup. That puts it behind the X99-Deluxe, whose appearance is quite similar, though not identical. 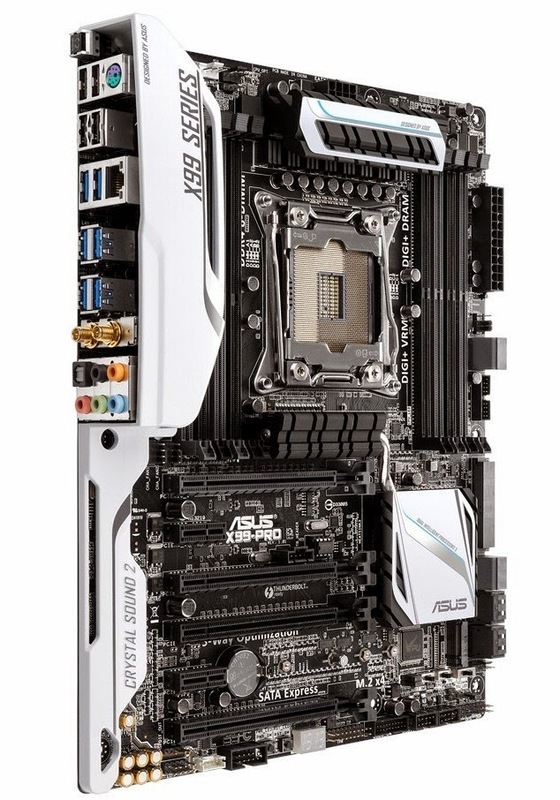 The ASUS X99-Pro is intended as the mid-range option. Never mind that the chipset and associated Haswell-E CPUs are so overpowered that none of them can be considered anything less than top-tier equipment. Still, ASUS wanted a bit of variety and price differences even on this level, so that's what it has set out to deliver. The platform uses the ATX form factor and measures 12 x 9.6 inches / 305 x 244 mm. It has the Intel LGA 2011-3 socket (22nm CPU support, Core i7) wired to eight DIMM slots, for up to 64GB, DDR4 3300/3200/3000/2800/2666/2400/2133 MHz Non-ECC, Un-buffered Memory. That's a lot, and it will increase to 128 GB in 2015 when there will finally be DIMMs with 16 GB of capacity per module. Graphics-wise, you can install up to three NVIDIA or AMD video cards and set them up in SLI / CrossFire configuration (x16, x16/x16, or x16/x16/x8). Then there's the wireless networking. The WLAN + Bluetooth controller on the X99-Pro is covered by a decorative white shroud that runs over the rear I/O area and covers the audio parts too. Moving on, ASUS installed an ALC1150 8-Channel High Definition Audio CODEC with Crystal Surround 2, plus various other features that will enhance quality one way or another. Speaking of which, there are a whole bunch of ASUS “special features” as well, like 5X protection, an energy processing unit and HomeCloud, but they're too many to list them all. Seriously, they make up a category larger than all the others on the product page. 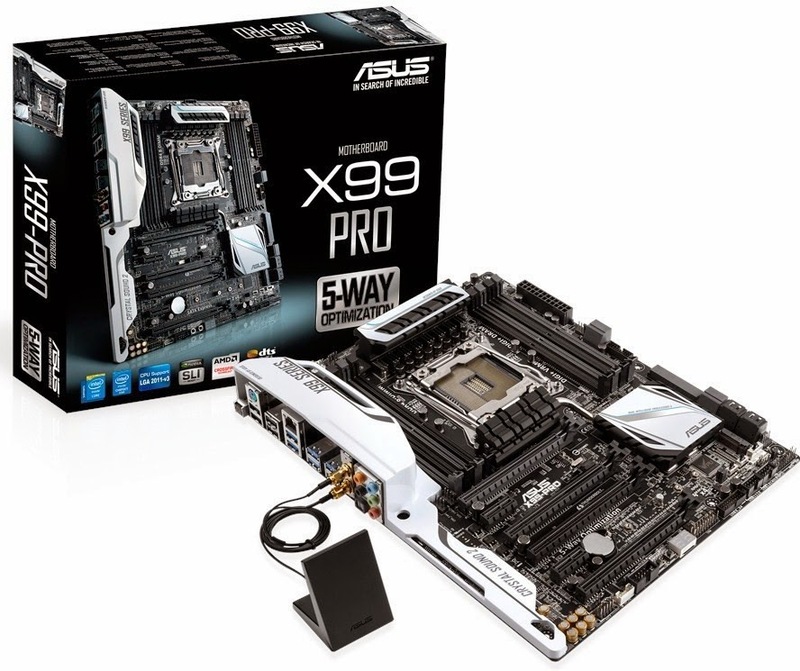 Sales of the X99-Pro motherboard should begin soon enough, if they haven't already, for $330 / €330. Buyers will be glad to know the blueprints made sure not to forget about USB 3.0, USB BIOS Flashback Button, or the PS/2 keyboard/mouse combo ports. Another motherboard, called X99-A should come as well, with fewer features, for the price of $275 / €275.